Depression is a debilitating illness that can affect daily life. 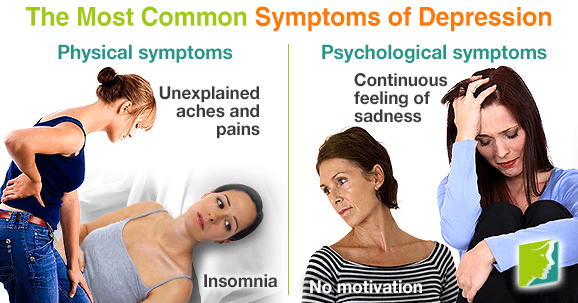 The symptoms of depression and their severity vary from person to person, but there is generally a common pattern. Read on to discover more about the most common symptoms of depression. It is normal to sometimes feel down and depressed, or to react emotionally to negative situations, but some people experience a state of chronic or prolonged sadness that will not go away - this is depression. It is a long-term illness that can negatively affect the life of the sufferer, and it is estimated that 1 in 10 American adults suffer from the illness. The symptoms of depression can be similar to sadness caused by grief or a physical illness (such as an underactive thyroid), but it is not the same. For depression sufferers, day-to-day life can seem impossible, and even the simplest of tasks can seem exhausting. Lack of sleep is both a cause and a symptom of depression, and can often lead to a vicious cycle, with depression-induced insomnia exacerbating the condition. Therefore, getting more shut-eye could help combat depression, and this could be done through cutting down on caffeine and alcohol, keeping your bedroom cool, and learning relaxation techniques, such as yoga or meditation. Loss of appetite is a commonly-reported symptom of depression and can often intensify it, so maintaining a healthy diet is key, even if you do not feel like eating much of the time. Not eating enough can lead to fatigue and lack of energy, and also means your body is not receiving the nutrients it needs. The body is generally tenser in times of stress, so chronic depression can lead to muscle aches. It might be worth taking up a stretching exercise regime (such as Pilates) in order to relieve the stiffness. While it can be triggered by certain events, a continuous feeling of sadness could have no apparent cause at all. The sufferer is normally overwhelmed by negative feelings, meaning he or she is unable to see a way out. Exercising is one way to combat this symptom of depression, as it releases endorphins and serotonin, which are natural mood-elevating neurotransmitters. This is a natural response to the hormonal and chemical imbalances that are occurring inside the body and brain. The tears can be uncontrollable and have no apparent trigger, or might be triggered by what is often seen by non-sufferers as “trivial” things. Crying more than what is normal for you could be a symptom of depression, so medical advice should be sought. Feeling overwhelmed by life is a common symptom of depression and can led to a lack of motivation in work, family, and social situations. The sufferer might start noticing poorer performance at work or a lack of interest in hobbies that were previously enjoyed. There are many symptoms of depression that can be exhibited, but some are experienced by the majority of sufferers, so these are the main indicators worth looking out for. Recognizing some of these common symptoms in yourself or another individual could mean that depression is developing and should be dealt with as soon as possible to reduce impact on everyday life. Menopausal depression is not common, but it does happen - and its causes are difficult to pin down. Learn more.